Swimming pools make for enjoyable entertainment especially on a hot summer day in Florida. Despite the enjoyment pools provide, the risk of serious injury is high when pools are not operated, maintained or secured properly. Negligent supervision or failure of swimming pool owners, operators, and manufacturers to exercise reasonable care may lead to catastrophic accidents involving both children and adults. With the enactment of the Residential Swimming Pool Safety Act in 2000, the Florida legislature recognized that in this state drowning is the leading cause of death of young children and a significant cause of death for medically frail elderly persons. The act placed a barrier requirement that pools built after Oct. 1, 2000 must have a fence or barrier at least 4 feet high on the outside. It also acknowledged that constant supervision is key to prevention of drowning. The statistics are alarming. A toddler can drown in two inches of water. Within three minutes of submersion – about the time it may take to step away and grab a bottle of water – most people will become unconscious. Rescue must occur within five minutes to reduce the risk of brain damage or death. Equipment manufacturers have a duty to ensure that the equipment they produce is safe for use. Similarly, pool owners must make sure that pool equipment and safety devices are operated and maintained in their intended manner to prevent a potentially hazardous condition. For example, when a pool drain cover is defective or broken, a young child may be held under the water’s surface and ultimately drown as a result. Pool ladders or slides that are not properly secured may also cause serious harm. Due to numerous pool equipment accidents, The Virginia Graeme Baker Pool & Spa Safety Act was signed into law in 2007 by the President in order to improve national pool and spa safety measures, after a seven-year-old girl drowned after being trapped under water by the powerful suction from a hot tub drain. A pool owner also has a duty to ensure that their pool has proper safety equipment. Florida’s public pool laws, Section 64E-9.008, requires all public swimming pools to have a shepherd’s hook attached to a one piece pole that is readily accessible to reach out to a distressed swimmer, and all pools with a slope transition to have a safety line. If this equipment is not readily available and an individual’s injury could have otherwise been alleviated had that equipment been there, then the owner may be held liable for the harm. Pool owners with lifeguards have a legal responsibility to ensure that those lifeguards are properly trained. Under Florida’s public pool laws, Section 64E-9.008, lifeguards or swimming instructors should be currently certified in first aid and cardiopulmonary resuscitation through the appropriate agency. Property owners have a duty to warn people of dangerous conditions. 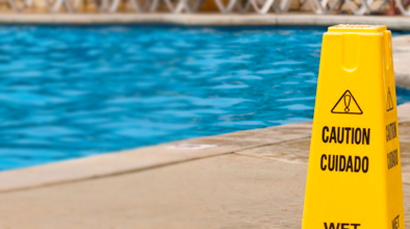 A pool owner at a hotel or resort has a responsibility to post a sign to warn their guests if there is no lifeguard on duty to avoid the risk of the guest presuming that there is a lifeguard there. If the owner neglects this duty, they may be held liable for failure to warn of a foreseeable danger. A public pool owner and even a private homeowner may be liable for certain injuries on their premises. If the proper barriers such as at least a 4 feet high fence or locked gates and alarm are not put up around swimming pools, the owner may be liable if a child drowning occurs there. Their pool may be considered an “attractive nuisance” for children. A pool owner has a responsibility to maintain the property in a reasonably safe condition. A cracked pool deck or diving board may lead to dangerous slips and falls. Improperly used pool-cleaning chemicals may create hazardous skin or health conditions. Tragically, these risks may sometimes result in death or a severe injury such as anoxic brain injury from lack of oxygen getting to the brain. Paralysis or traumatic brain injury may also occur if a person’s neck or head hits the bottom of a pool or a rock at a hard and sharp angle. Negligence: When the duty to exercise reasonable care against a foreseeable harm is breached, a person may be liable for monetary damages or in special circumstances injunctive relief [a court order where an individual is restrained from performing a particular act] in a civil lawsuit for negligence. For example, babysitters or lifeguards have a responsibility to know that young children or inexperienced swimmers are at risk of drowning without proper supervision so if they fail to do so and a child is harmed, then the parents may sue these individuals for negligence. Product Liability: Makers or sellers of a product have a responsibility to ensure that the products they make or sell are safe for consumers when used properly. If this duty is breached allowing individuals to be harmed by an unsafe product, then those who have been injured may be able to file a cause of action against the product manufacturer or vendor. For instance, if an inflatable baby float tears and causes toddlers to fall into or under the water, then parents of children who have been injured while using these floats may be able to sue for damages. Premises Liability: A set of laws make the person who is in possession of property responsible for certain injuries due to negligence suffered by persons who are present on the premises. For example, this may apply to a business owner if a guest on the property is harmed due to the owner’s failure to maintain equipment or properly warn guest of a foreseeable danger. If you or a family member or loved one has been injured in a diving or drowning accident due to negligence, then our dedicated personal injury attorneys at Swope, Rodante P.A. may be able help you file the claim to pursue the maximum settlement to recover from your injuries. Damages may include any medical bills, physical therapy or counseling that may be needed after the incident. In the case of a wrongful death, our legal team may be able to help you recover damages for medical bills for the injury that caused the death, and funeral and burial expenses. Our attorneys may build your case through gathering evidence, which may include data from dive computers, witness statements, experts who may be able to re-construct the accident scene. If you would like to speak with one of our representatives about your case, please contact us. Drowning is the leading cause of death among Florida’s children ages 1 to 4. Seventy-three of Florida’s children ages 1-4 drowned and at least 51 of them (70 percent) drowned in a residential swimming pool. Males of all ages, especially those ages 1-4, were more likely to drown than females. On October 1, 2000, Florida enacted the Residential Swimming Pool Safety Act, but 90 percent of residential pools were built prior to this date, and are not subject to the act. In 2008, 745 children ages 14 and under died from unintentional drowning. Children younger than 5-years-old represent nearly 75 percent of child drowning fatalities. (Source: National Drowning Prevention Alliance). Seventy percent of African-American and sixty percent of Hispanic/Latino children cannot swim. (Source: National research study by the USA Swimming Foundation and the University of Memphis). The fatal drowning rate of black children ages 5 to 14 is almost three times that of their Caucasian peers. (Source: Centers for Disease Control and Prevention). For every near-drowning prevented, typical medical cost savings can range from $75,000 for initial treatment to $180,000 a year for long-term care. Each year in the United States, Europe and Asia an average of 125 scuba diving fatalities occur, statistics from Divers Alert Network show. Drowning is listed as a cause of death in 70 percent of scuba diving fatalities. Vann RD, Lang MA, eds. Recreational Diving Fatalities. Proceedings of the Divers Alert Network, 2010 April 8-10 Workshop. Durham, NC. : Divers Alert Network, 2011. ISBN #978-0-615-54812-8.